This one-day class is a good introduction to the art of willow weaving, or will allow you to develop your skills if you have some experience. 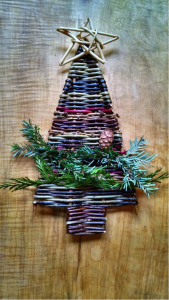 You will make attractive festive decorations such as stars and woven Christmas trees while learning how to use the tools of the basket maker and the art of soaking and preparing willow. You will also have the opportunity to incorporate winter foliage into your piece, such as hazel, birch and dogwood. We will discuss how to identify and collect these hedgerow materials and then assess their suitability for weaving alongside willow. You will also be able to add colours and textures to your work by using festive trimmings. We will celebrate the approaching season with mince pies!